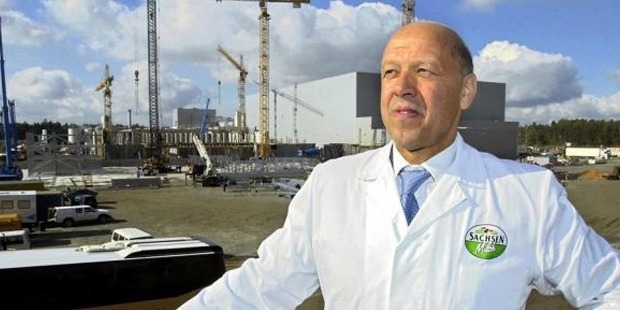 Theo Mueller is a successful and thriving German billionaire and businessman. He was born in Germany in the year 1940. He inherited the dairy company Unternehmensgruppe Theo Müller. 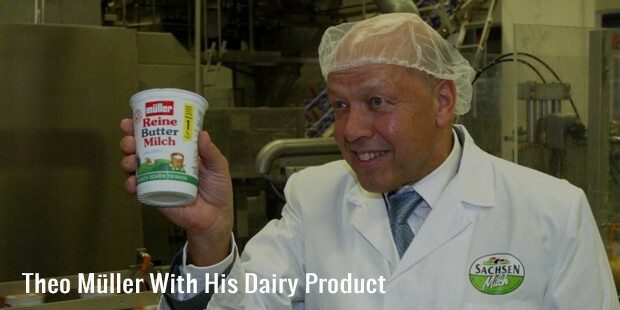 This 75 year old heir is the sole owner of the dairy giant Müller. According to Forbes, Müller is the 32nd richest man in Germany and 462nd richest man in the world. Müller played a big role in building up distribution, sales and infrastructure by implementing new techniques in milk processing. His current net worth is approximately $3.8 billion. Not much is known about Müller’s childhood but we know that he was born in Aretsried, Germany in the year 1940. In the year 1971, Müller took over from his father the dairy company. Back then the business comprised of only four employees. Gradually and successfully Müller implemented new techniques in milk processing, which resulted in large-scale expansion and sales for the company. After successfully taking over the family dairy business from his father in the year 1971, Müller went on to expanding and diversifying the unit. Müller became the first ever-dairy unit in Germany, which offered nation-wide distribution of fresh milk and milk products. Müller aggressively advertised the companies’ dairy products on television. Some of the advertisements even featured the celebrated soccer player Gerd Mueller. Besides expansion and diversification of the dairy company, Müller is actively involved in subsidiary industries. The Theo Müller Group has a fish restaurant chain (Nordsee), a transportation unit (Fahrzeugtechnik Aretsried), a packing company (Optipack) and a logistics company (Culina). 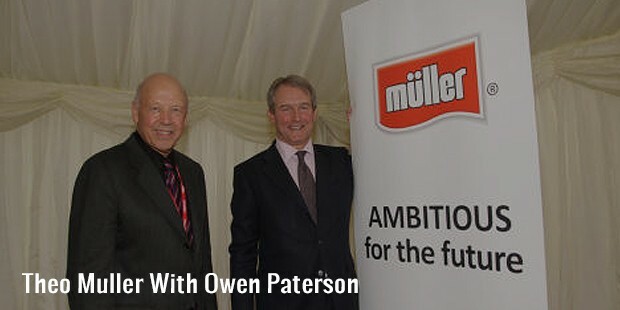 In the year 2012, Müller successfully purchased for a whooping 280 million pounds a company called Robert Wiseman Dairies, which supplies almost 30 per cent of the UK’s fresh milk products. In 2014, Müller purchased another dairy company, Dairy Crest for 80 million pounds. 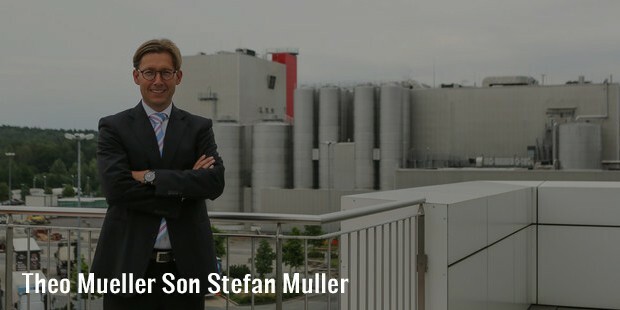 Theo is the sole owner of Müller as of 2015. In 1971, Theo took over the family dairy business from his father, and expanded it nationwide. Over the next few decades, Müller diversified the family business and got involved in the packaging, logistics, and fish and baked goods industries. In 2012, Theo further expanded his dairy business by purchasing a United Kingdom based dairy company, Robert Wiseman Dairies. In 2014 he purchased yet another milk processing company Dairy Crest. Theo was born in Germany. He is the son of Alois Müller. This 74-75 year old billionaire is currently in a relationship. Theo has 9 children. As such, Müller has not received any noteworthy awards. However, he has acquired a large number of dairy companies and expanded his own unit vastly. When he took over the family business in the year 1971, it comprised of only four employees. Today that same company has thousands of employees across Europe.